This post may contain affiliate links. Please see the disclosure at the bottom of this page for more information. Fall color isn’t limited to foliage. Just as the trees in my yard have turned, the fruit on the 14 pepper plants in my garden have changed from green to rainbow of deep autumnal hues – red, orange, yellow, and even chocolate brown. And their transformation isn’t limited to color. As they mature, sweet peppers become even sweeter and hot peppers achieve the peak of their flavor. 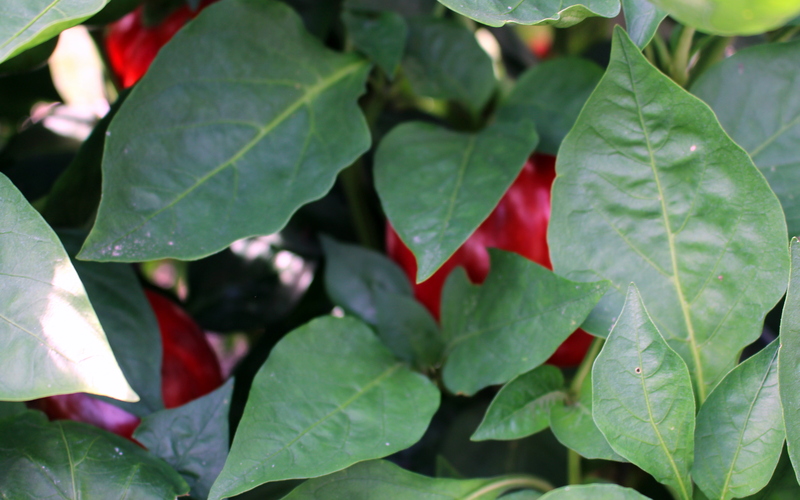 Ripe red bell peppers peeking through the foliage. If left unpicked, peppers will continue to ripen until the first frost. When a frost is in the forecast, it’s time to pick all the remaining peppers from the plant. This harvest may result in more peppers than you can possibly eat fresh. 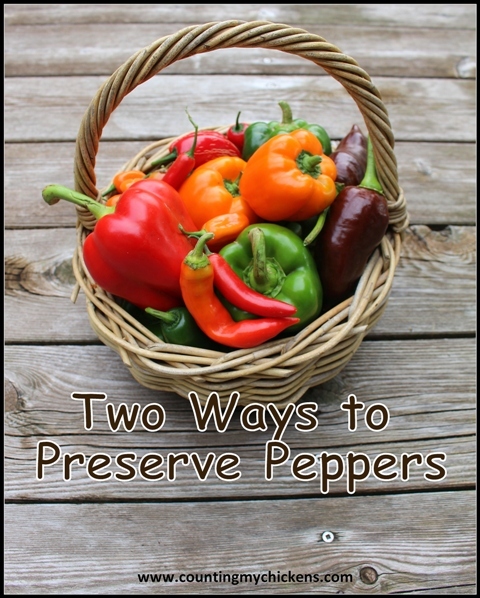 Fortunately, it’s easy to preserve peppers for winter use. Thick-skinned peppers, such as all varieties of sweet bell peppers, are best preserved by freezing. Spread the pieces in a single layer on a cookie sheet and place in the freezer for 30 minutes to one hour. Pre-freezing prevents the peppers from being squashed or bruised during packaging. Package the pepper pieces in freezer bags at a ratio of 10 ounces of peppers per quart bag. Gently squeeze out any air from the bag and seal. 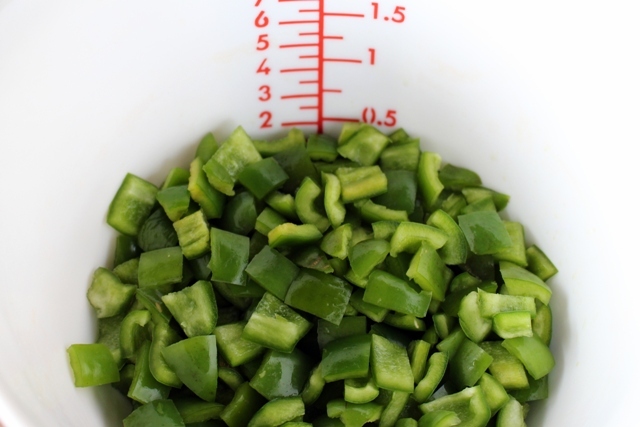 For freezing large quantities of peppers, consider investing in a vacuum sealing machine. This handy kitchen tool removes all of the air from the freezer bag before sealing, which helps to maintain the quality of the frozen food. Use the frozen pepper pieces throughout the winter as a topping on homemade pizza or in chili, stews, or other dishes. You don’t need to thaw the peppers before cooking. 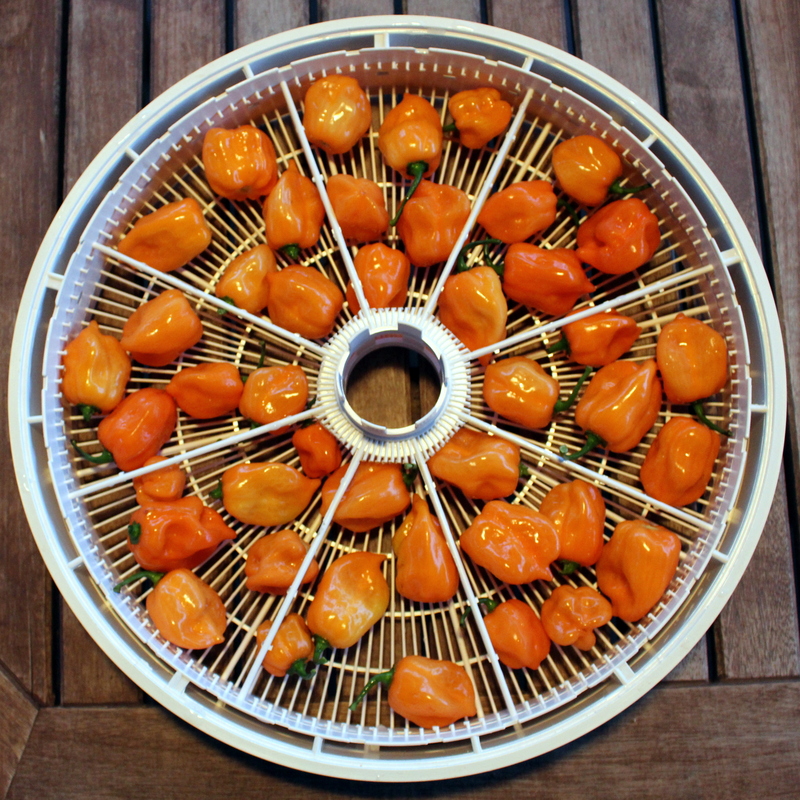 Drying, or dehydrating, is a great way to preserve hot peppers such as ancho, habanero, and cayenne. You can use a conventional electric oven or even the sun to dry peppers, but my preferred method is an electric food dehydrator. It takes less electricity than an oven – and frees up the oven for other uses – and doesn’t require the extended perfect weather conditions needed for sun drying. 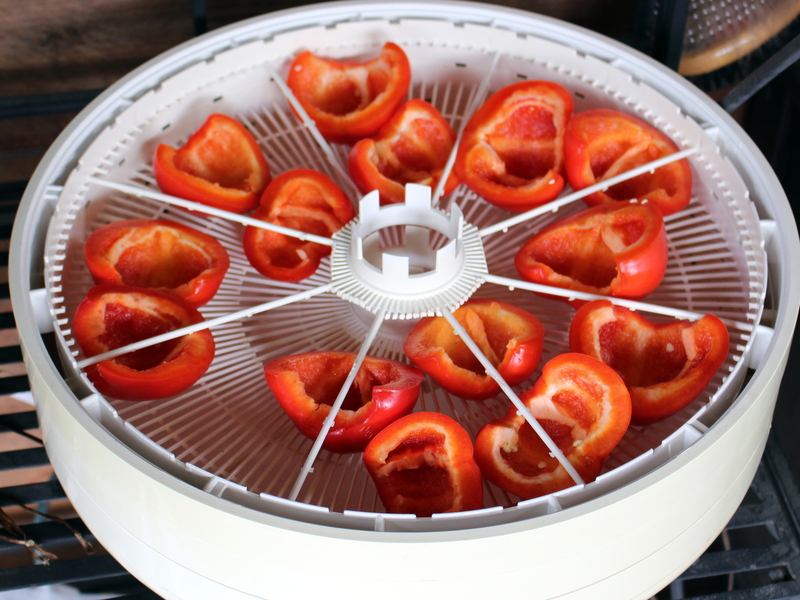 A food dehydrator uses a fan to circulate low heat evenly over the food. There are many food dehydrators available on the market. Mine ranges from 90 to 160 degrees Fahrenheit and has a programmable timer up to 48 hours. To prepare peppers for drying, wash and remove any blemishes. You can dry smaller peppers whole; slice or dice larger peppers into uniform pieces. If you want less heat from hot peppers, slice them in half and remove the seeds before drying (use gloves). Preparing habanero peppers for drying. For best results, follow the manufacturer’s directions for drying times and temperatures for your specific electric food dehydrator. Store dehydrated peppers in a cool, dark place in an airtight container. A zipper-style freezer bag works well for this purpose. To rehydrate, cover the peppers with boiling water and let stand 20 to 30 minutes until they absorb most of the water. Use in cooking as you would raw peppers. Alternatively, you can grind dried peppers into powder and use in cooking as a spice. This entry was posted in Preserving the Harvest and tagged dehydrating peppers, drying peppers, food preservation, freezing peppers, peppers by Deborah Neyens. Bookmark the permalink.